The ESTEC-funded 94-GHz Galileo radar at Chilbolton is especially suited to the study of clouds; it is more sensitive than the 3-GHz radar, but more importantly, is unaffected by ground clutter. It is currently operating continuously from the ground. Until October 2000 it was secured to the side of the main 25 metre dish to allow the two instruments to scan together, but it was found that the vertically-pointing dataset was interrupted too often when the main dish was scanning. The instrument was Dopplerised in September 1998, enabling high-resolution measurements to be made of the spectrum of particle fall speeds, and therefore their size distribution. 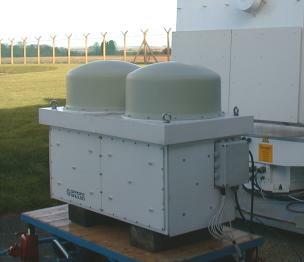 Until April 1999 we also had the use of a 35-GHz radar, on loan from the university of Toulouse. Chilbolton is also equipped with a 905-nm lidar ceilometer, on load from ESTEC. Compared with the radar, this instrument is much more sensitive to small particles, so gets a much stronger return from liquid water clouds and can detect aerosol particles in the lowest 2 km of the atmosphere. These differences can be exploited to measure particle size and infer whether a cloud colder than 0° is composed of ice or liquid water. Recently, and a number of microwave radiometers have been constructed at Chilbolton which will enable liquid water path to be derived.